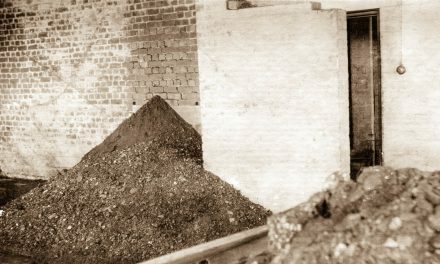 In 1993 the Victorian State Government Minister for Major Projects, the Hon Mark Birrell, established the Bundoora-Mont Park Reference Group (or BMPRG) whose objectives were to provide a range of recommendations to do with ecological, heritage and traffic issues, so as to establish a set of ‘building blocks’ for the future planning and development of the area. 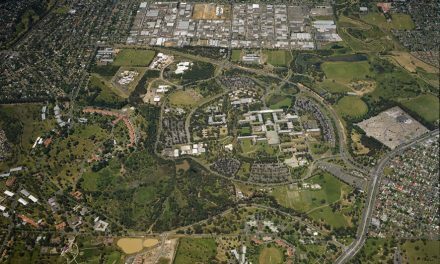 In 1996 the Victorian Government, through the Office of Major Projects, produced a document titled ‘Mont Park/Plenty – Call for Expressions of Interest’ wherein it invited companies and groups from the development industry to consider managing the staged redevelopment of the 74 hectare Mont Park Hospital site. 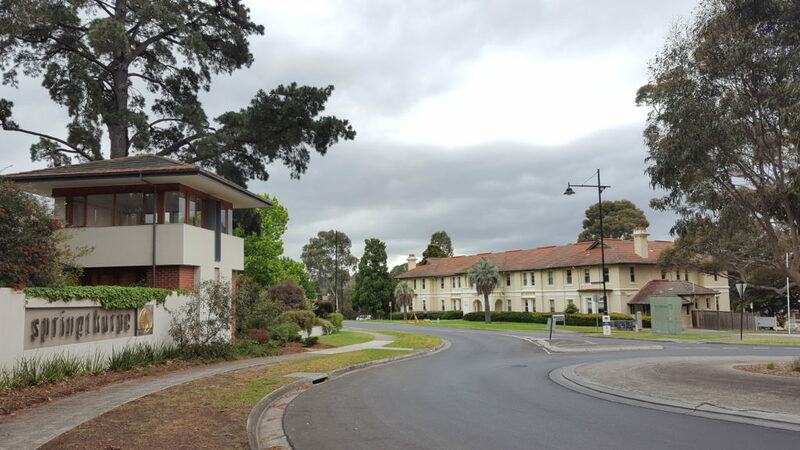 This master-plan included the obligation to retain all ‘Heritage Listed’ aspects of the former Mont Park Hospital precinct, as well as a number of other ‘heritage sensitive’ aspects of the site. To this end a number of former Buildings still adorn the area and have found themselves new life as either accommodation, office or teaching facilities. [See Hyperlink here to the ‘Mont Park Buildings’ page within this website]. 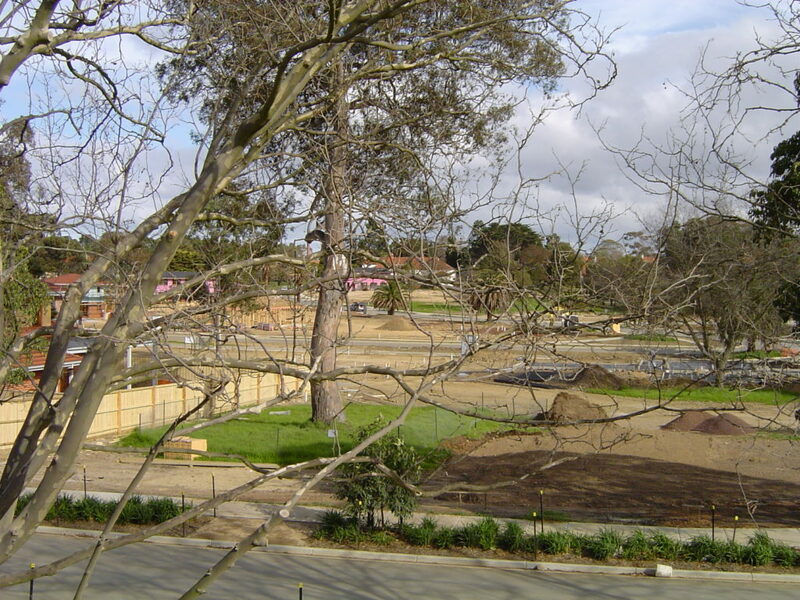 In July and August of 1999, arboricultural consultants, TREElogic, in association with Mark McWha Pty Ltd were engaged to provide a thorough arboricultural assessment of all the trees on the Mont Park development site. 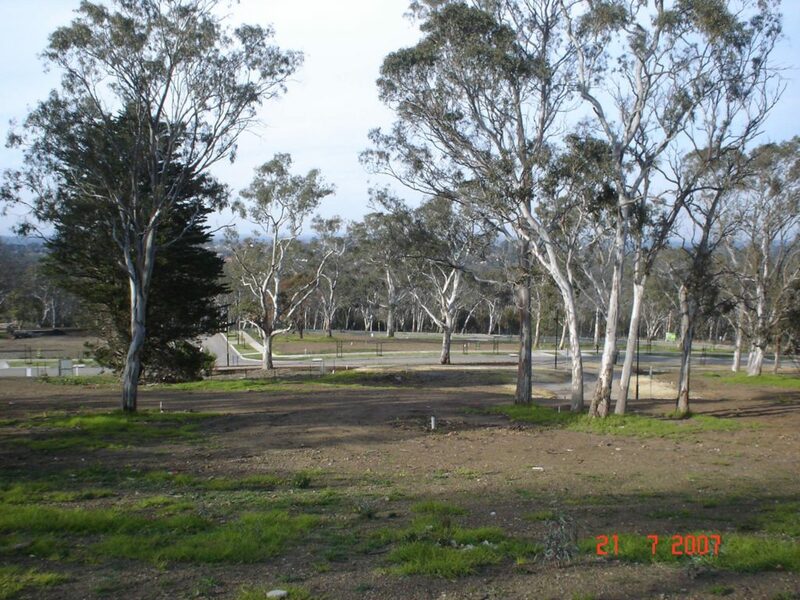 Great importance was placed on the retention of the fundamental character of the Mont Park landscape, and in particular the preserving of many of its majestic trees (Eucalyptus/River Red Gums, and Acacia/Wattle trees etc) as possible. Therefore an audit of every single tree (numbering 4,338 trees) was conducted, and an assessment made and a report provided on each tree in terms of its potential to be retained (where possible, including those located on residential blocks). The audit also looked at the important issue of ongoing tree management. The landscape architect & urban design practice of Taylor Cullity Lethlean (or ‘TCL’) then took over from Mark McWha Pty Ltd and completed the detailed design of the Estate on behalf of UPL. 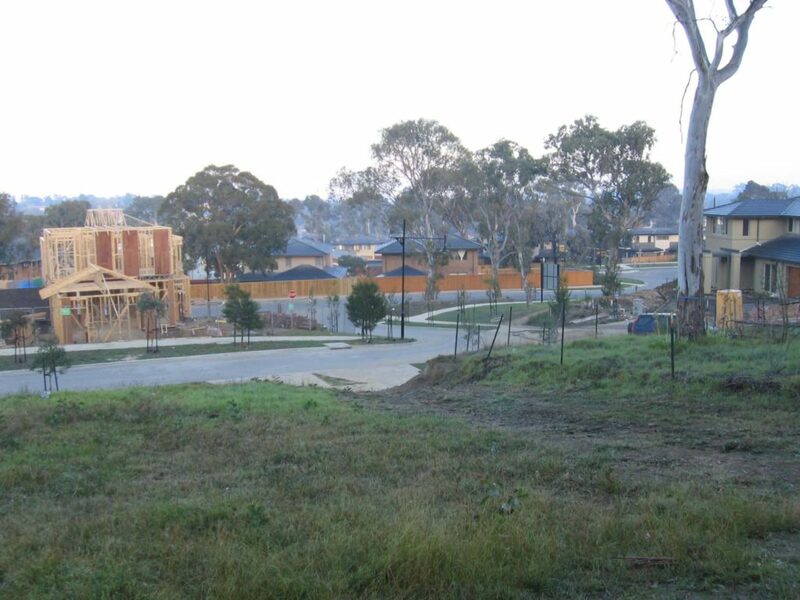 TCL went on to be presented with multiple Urban Development Institute of Australia ‘Awards for Excellence’ in 2003 and 2004 for its Urban Renewal, Residential, Master-planned, and Environmental Excellence Projects relating to its work on the Springthorpe Estate Project. 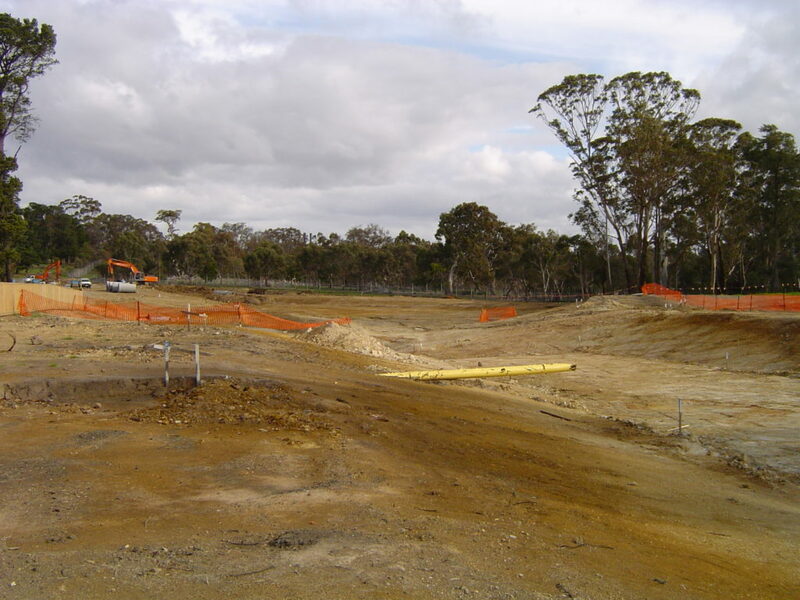 Throughout the duration of the project, Paroissien Grant and Associates Pty Ltd undertook all of the survey works including all of the plans of subdivision. They later undertook the civil engineering design for a few of the development stages as well. 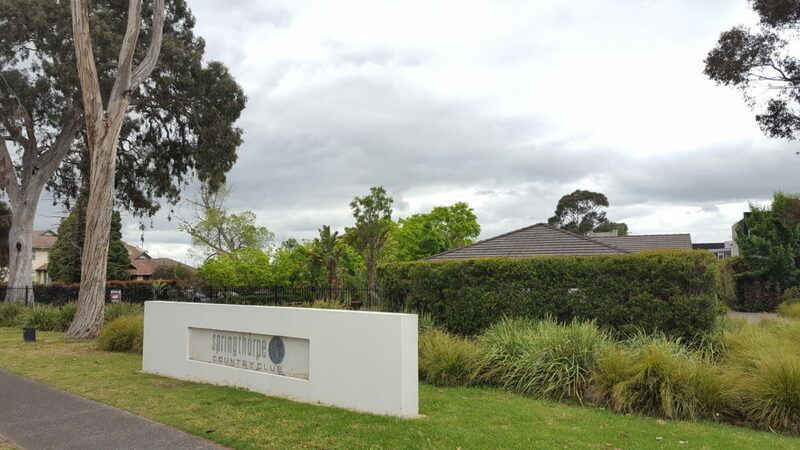 The first plan of subdivision was registered in December 2001 for about 20 Lots (of land) near Cherry Street at the Waiora Road entrance to the Springthorpe Estate, and the first homes in the Springthorpe Estate began being built at this location soon after. Building and construction continued somewhat furiously in and around the Springthorpe Estate in stages from about 2002 onward for the next 5 – 6 years. Springthorpe on Linaker Drive looking south back to the Ernest Jones Hall. 2003. Images courtesy of Joe Carbone. Springthorpe on Linaker Drive looking south back to the Ernest Jones Hall and ‘The Cascades’. 2003. Images courtesy of Joe Carbone. Springthorpe looking south from Lookout Rise, 2006. Image courtesy of Mick Jackson. A centrepiece to the overall development was the fairly unique concept of a Springthorpe Estate Country Club which by necessity required the creation of an Owners Corporation to manage the asset that is the Country Club, Pool, BBQ, Gym and Tennis Court area as well as coordinate its accessibility and ongoing finances. It is noteworthy that the Country Club (as it is known today) was used as a Display Centre during the development of the Estate. 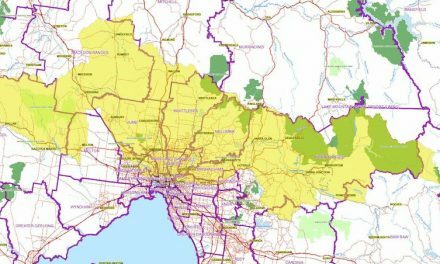 In 2007 Urban Pacific Ltd released the last 60 blocks of land as part of its ninth and last stage of land release. Springthorpe looking east from the eastern slope of Gresswell Hill over Crestwood Avenue, 2007. Image courtesy of Phil Watkins. Aerial view of the Springthorpe Estate, 2017. Image courtesy of Google Maps. 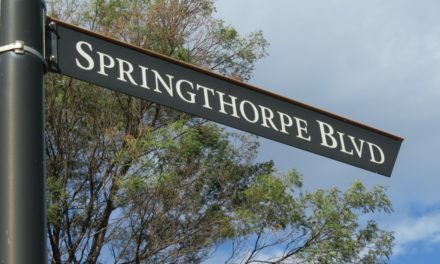 The Main Entrance to the Springthorpe Estate (built 2002). 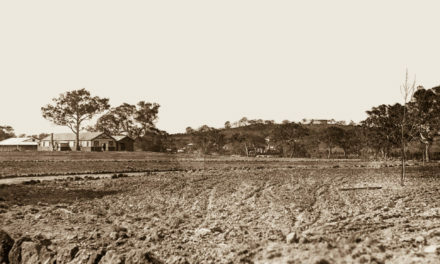 To the left is Stage 1 of the Springthorpe Development, and in the background, The Nurses Hostel and Matrons Flat (built 1923), later used as the Australian Womens Land Army Quarters (circa WW2) and later again as the N.E.M.P.S. 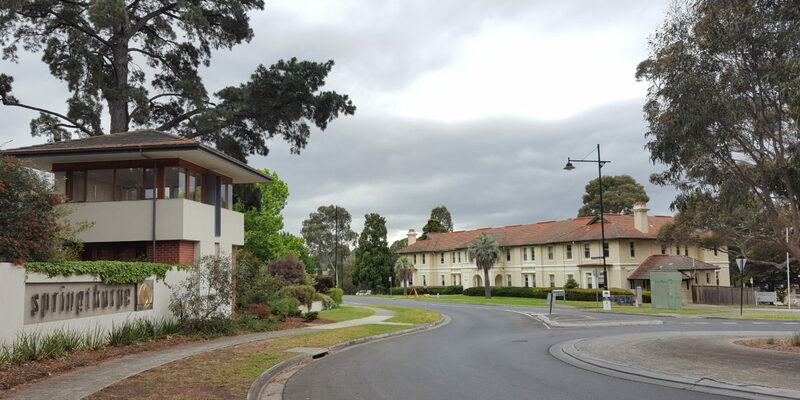 (North Eastern Metropolitan Psychiatric Services) Administration, and now is used for La Trobe University Student Accommodation, 2017. Image courtesy of Gary Cotchin. 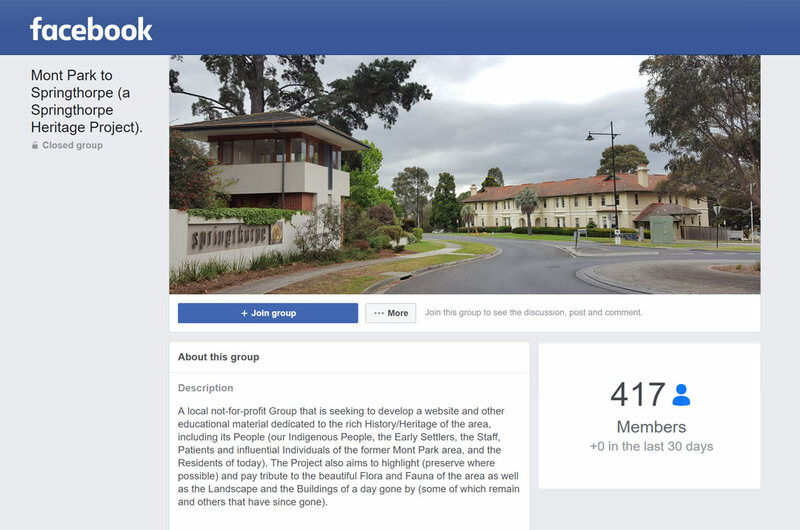 = The Bundoora-Mont Park Reference Group. A Master Plan For The Future – Final Report. 1995. = Public Affairs Branch of the Department of Infrastructure. Mont Park/Plenty – Call for Expressions of Interest. 1996. 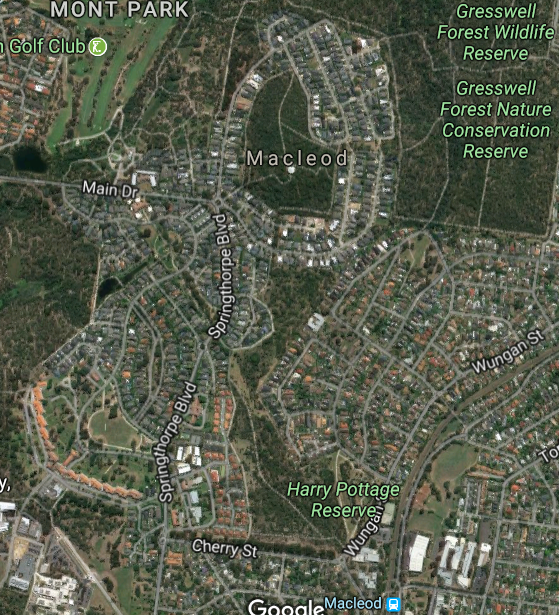 = Mark McWha Pty Ltd. Mont Park Development Plan Landscape Master Plan Report for Urban Pacific. 2000. = Urban Pacific. Springthorpe Development Plan. 2001. Note: Special mention (and our thanks) goes to Mr William McMahon of Paroissien Grant and Associates Pty Ltd for all of his assistance to date with our Local History project, including the provision of relevant materials, as well as his personal recollections of the development of the Springthorpe Estate. NextTHE MONT PARK PLATFORM AND RAIL LINE.